Take rice in a bowl and add water. Wash the rice well and drain water. Add the measured water to cook the rice. Place this bowl in pressure cooker and cook. After first whistle, cook rice on low flame for 15 minutes. Allow the pressure cooker to cool by itself. Remove the rice bowl from the cooker and spread rice in a plate. Take tamarind in a microwave safe bowl and add 50ml water. Place this bowl in microwave oven and cook on high power till it reaches a boil (45 seconds). Cool and grind the cooked tamarind with 35ml water to a smooth paste and strain it to remove fiber. Wash and slit green chilies. Wash curry leaves. Take 2tsps mustard seeds and 2 red chilies which have been broken into pieces. Using a mortar and pestle grind the mustard seeds and red chili pieces adding around 25ml water to a smooth paste. Add tamarind paste, mustard paste and salt to the rice and mix well. Heat a pan and add oil. When oil is hot add cashew nut pieces and fry till they turn golden in color. Remove the cashew pieces from oil and add to the prepared rice. Add peanuts and fry and add them to the prepared rice. To the remaining oil add Bengal gram, black gram and fenugreek seeds. Fry till the seeds start changing color. Then add mustard seeds and allow them to splutter. Then add slit green chilies, curry leaves and fry till chilies are fried well. Then switch off the flame and add red chilies and asafetida and turmeric powder. Mix and immediately transfer the seasoning along with oil to the prepared rice. Mix the rice well till it gets the color of turmeric. Transfer to a serving bowl and serve. It is advisable to grind the mustard seeds and red chilies using a mortar and pestle only to get the real flavor of mustard. Grinding in a mixer grinder would give a mild mustard flavor. When red chilies are added to the seasoning see that they do not turn dark red or black in color---that is the reason we have added them after switching off the stove. Similarly after adding turmeric powder to the hot oil just mix and immediately transfer the mixture to the rice or else the turmeric gets burnt and tastes bad. Adding turmeric in hot oil instantly brings out the color which when mixed with rice gives a nice color. Fry all the seasoning ingredients, cashew nut pieces and peanuts to a golden color to bring out the taste---do not fry them till they get deep color. This pulihora tastes best when served after 2 hours of preparing it---by that time rice absorbs all the flavors and tastes better. 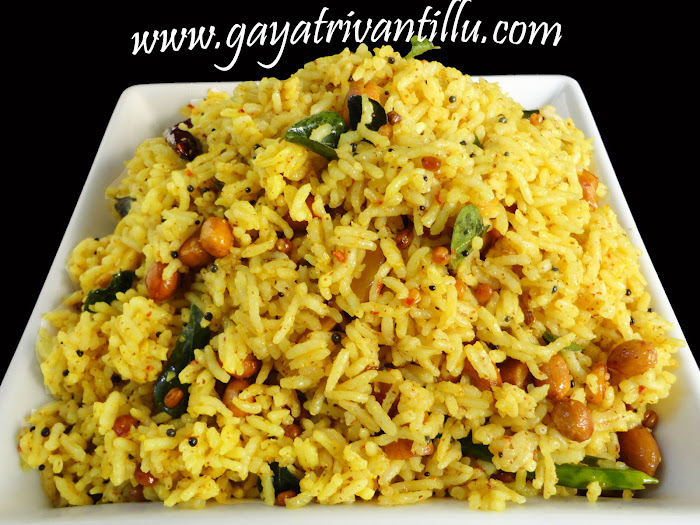 This recipe is a variation of Tamarind Rice Recipe video below. For the recipe text in English Click here.